Off-site and cloud-based backup: my solution. box.net is a bit too business-focused. MobileMe may provide extra features but only 20GB of storage. Also don’t like having to pay in one big chunk for a year’s service. SugarSync is interesting and the cheapest of the options above, but I didn’t like the interface. As I navigated to the Dropbox website to give them my credit card details, I remembered Zumodrive. I used to use it all of the time last academic year, but hadn’t looked at it for a while. I thought it could be perfect for my needs! Why? It now has ‘folder linking’. This means changes made in a particular folder are always reflected in Zumodrive with no extra actions needed by the user. This is also the case in the other solutions outlined above, but didn’t used to be the case with Zumodrive (it used to be like an online USB flash drive). Photos are automatically synced with either iPhoto or Picasa (I use the latter). This is particularly handy for the photos I don’t deem worthy enough to go on my Flickr account. As with Dropbox and other solutions, you can instantly share any file with others through a link on Zumodrive. The cheapest upgrade is only $2.99/month. You can open files from iWork 09. I signed up for the $6.99/month 25GB option. However, calculating the amount of data I was going to need to backup overall it looked like I was going to have to spend $9.99/month for 50GB and then, before long, probably have to move up to the 100GB $19.99/month plan. I didn’t like the sound of that. 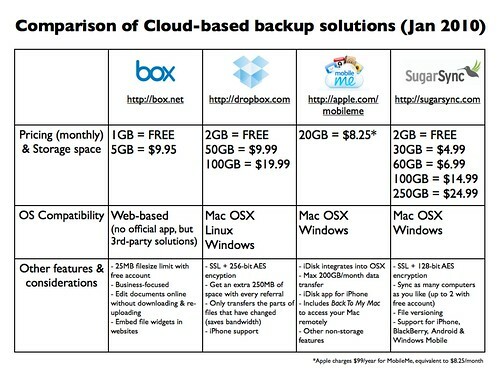 Thinking about this, I realised that I’d conflated cloud-based and off-site storage. What I really need is something to sync Documents and other files of my choosing so they’re available quickly and easily (e.g. via my iPhone). And then, separately, I need an ongoing archive of all of my stuff. I need 7 more people to sign up for Dropbox to get my maximum referral bonus space (3GB). If you’re going to sign up, would you consider using one of the links to the service in this post please? What are YOU using? Why? Cheers Doug. I have been playing around with various solutions for a while now, but have signed up to Dropbox and Mozy thanks to this post. I use a combination of Dropbox and Mesh. I use dropbox for my school files that I regularly use as I love being able to access what I need on my iPhone as well. 2GB (plus my referral bonuses) seems to be enough for my day to day files. Mesh offers 5GB for free which I use to sync my other folders. I had exclusively used Mesh until the iPhone app for dropbox was released….My problem is what to do with the huge number of pictures and videos that I have. I have taken to agreeing a swap of NAS space with my brother: not true syncing but it is a backup. I made the distinction between file synching and file backup. I use Microsoft’s Live Mesh to sync all the files I need at home and work. This has saved the need for USB flash drives and also means I have a backup I can access online. This is limited to 5Gb though, and is no good for recovering files you accidentally delete (although they do move to the recycle bin if you have it enabled). Dropbox free edition wasn’t big enough, and I don’t like the way dropbox would sync MS Office temp files if you opened files straight from the dropbox (which is how I used it). I use Carbonite on my laptop which was cheap (~£34 for 14 months) and has no storage limits. I use this to make my “disaster recovery” backup – music, photos and documents. I’ve got 26Gb stored online, but you need a decent upload speed – my first upload took weeks to complete (with hindsight I should have been a bit naughty and taken my laptop to work and made use of our faster uplink times!). The only problem with systems like this is that you never know how good they really are until you have to recover your data following a disaster! I am surprised you didn’t like the SugarSync interface. I’ve been using them for years and have found it to be fast, reliable, and their iPhone app is fantastic. Give them a second look if you are ever in the market again. They also are quick to answer stuff via twitter, @sugarsync. I’ve yet to do anything off site; its on my list to do soon! I used Jungle Disk for a while, but found it a bit clunky. Thanks for the MacWorld link!